After two weeks of flights, jeeps and trekking, Alan and I have established ourselves in a base camp at the head of the Rolwaling Valley on the Drolambao Glacier at nearly 18,000 ft. Above our camp we are surrounded by iconic peaks, many of which have only been climbed once, if ever: Takargo, Langmoche Ri (which Alan and I made the first peak ascent of in 2012) and of course, Tengi Ragi Tau. To start the expedition off right, we decided to attempt the West Face of Pachermo (~20,590 ft), an enticing wall of rock, ice and snow rising 3,000 ft directly above camp. 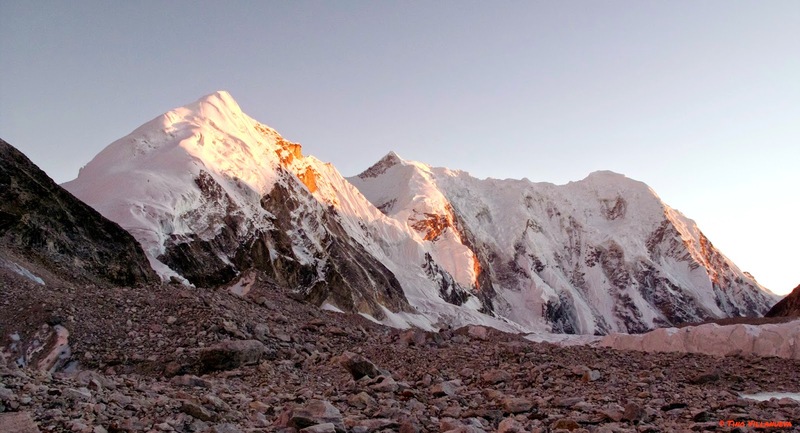 Pachermo is a classified as a trekking peak and many groups traveling from the Rolwaling to the Khumbu climb it's North Ridge. We knew little about the West Face or whether it had been climbed, only that it looked cool. We launched into Pachermo via snow ramps connected by ice and rock steps. 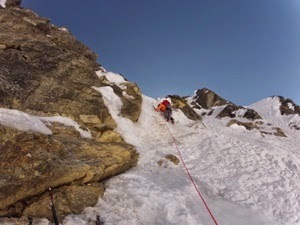 The lower two-thirds of the route provided super classic climbing, with solid rock in crux steps and quality ice. 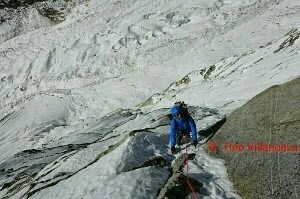 I even dubbed one pitch the "Cham pitch" due to the quality of the climbing in neve grooves surrounded by granite. The technical difficulties clocked in at AI4 M5. However, as most of the difficult alpine climbs I've done, the technical grades do nothing to describe the actual difficulties encountered on route. Outside of the classic pitches on rock and ice, we wallowed through steep 60+ degree snow. And while it was really cool to move through runnels and flutings of snow, we often found ourselves swimming up faceted sugar snow barely covering rock slabs. A delicate technique is required to balance all extremities over the snow so as not to punch in a leg and slip down the snow or worse, break through to the smooth slabs underneath. And when the terrain got really steep we turned to tunneling through the snow, which would be overhead until literally digging a part through.